Just opposite the Mint is Christ Church Burial Ground. 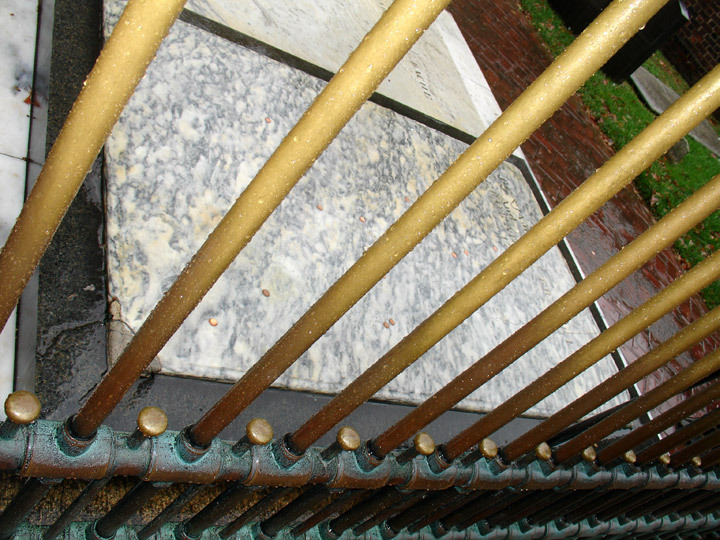 Here Benjamin and Deborah Franklin's graves can be seen from the street through the grating. 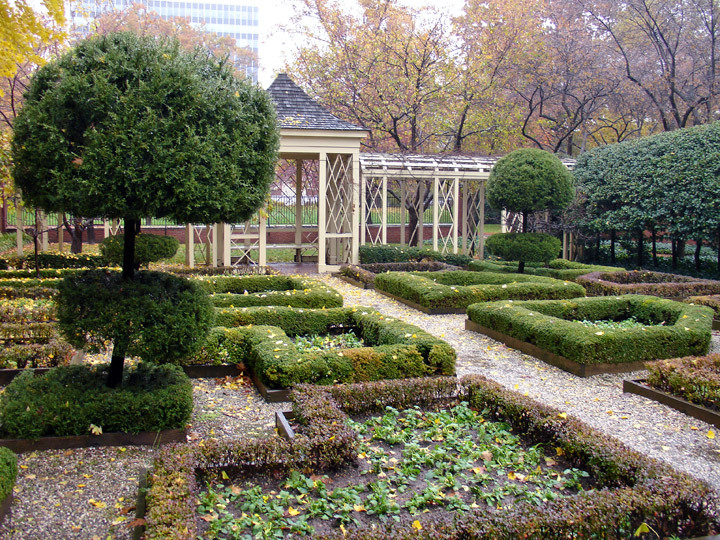 At Franklin's death some 20,000 Philadelphians followed his cortege to his grave here, as his death in 1790 severed the tie to Colonial Philadelphia. William Smith, Provost of the University of Pennsylvania and his old enemy, gave the eulogy in Christ Church, and the Comte de Mirabeau did the same before the French National Assembly in Paris. 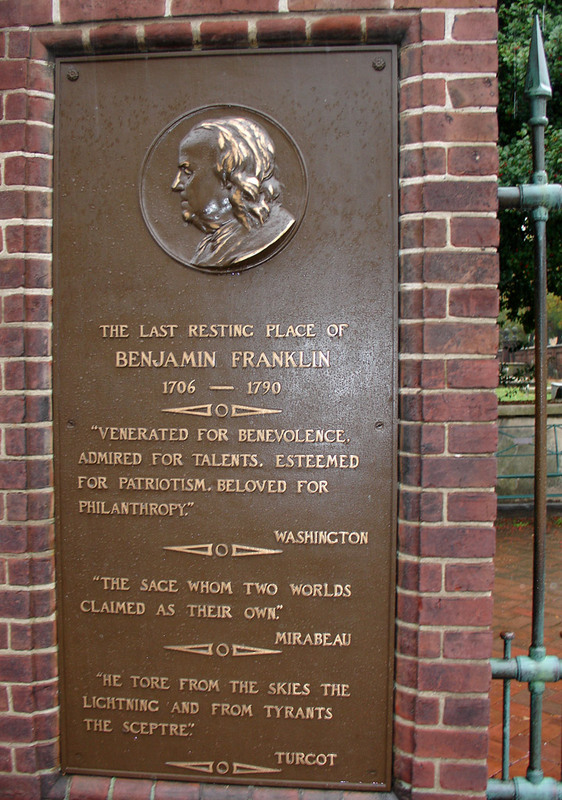 Franklin was as well loved by the French as by the Americans and as honored by them, too. 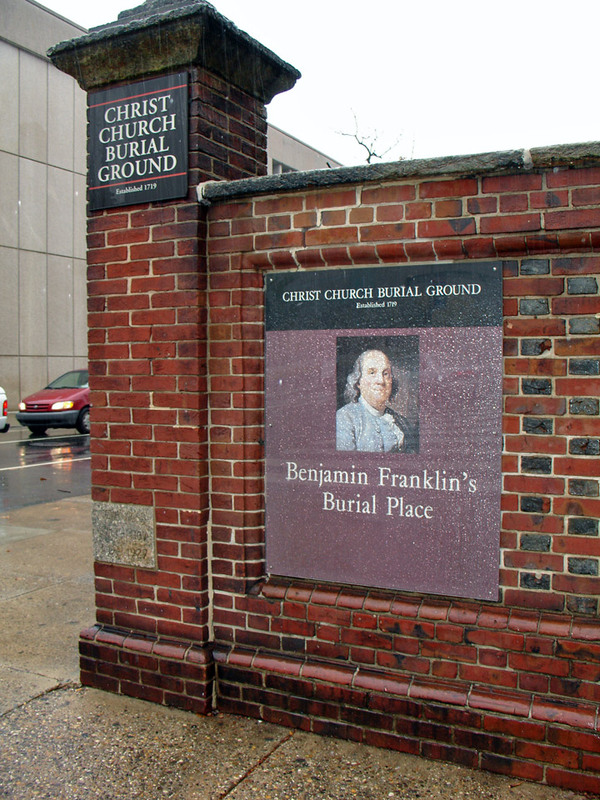 Also buried here are Benjamin Rush (1745-1813), the Father of American Medicine who was also a Declaration signer and Philip Syng Physick (1768-1837), Father of American Surgery. Three other Signers lie here: George Ross, Joseph Hewes, and Francis Hopkinson (1737-91) — a composer who also designed flags and currency. On 4th Street is one of the most magnificent houses in America. 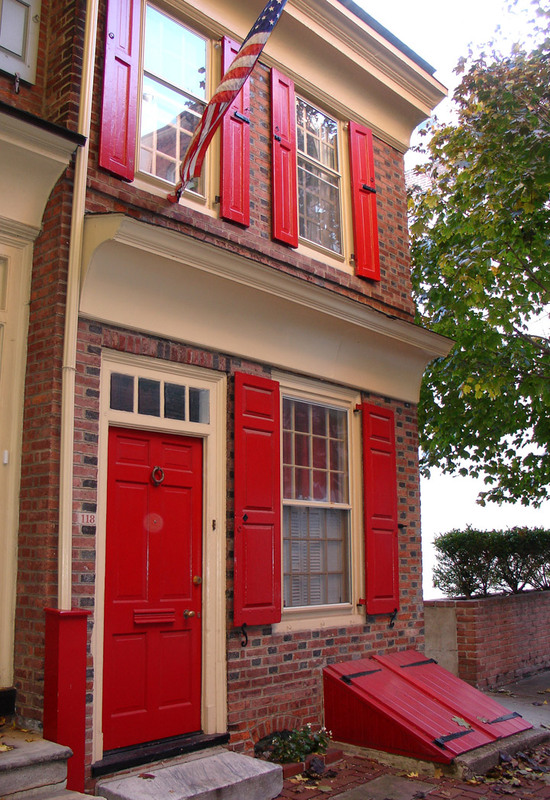 It is the only free-standing house in Society Hill and a superb example of a Federal house restored with Federal furniture. From the moment one enters and hear the guide's friendly, "Welcome to Dr. Physick's House," we are spellbound. The house was built in 1786 by Henry Hill, the executor of Benjamin Franklin's will. It was purchased for Philip Syng Physick (1768-1837) by his sister in 1790. The good doctor lived in the house from 1815 until his death, and his descendants lived here until 1941. Napoleon's influence is everywhere, from the rugs to the swan motif in the wallpaper. 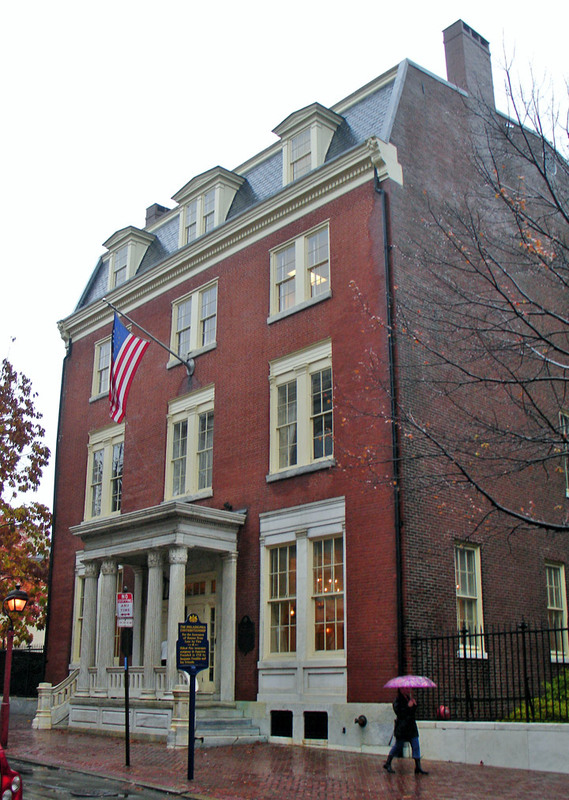 The Society of Cincinnatus, one of the oldest and most distinguished in the United States, has its headquarters in the upstairs parlor. 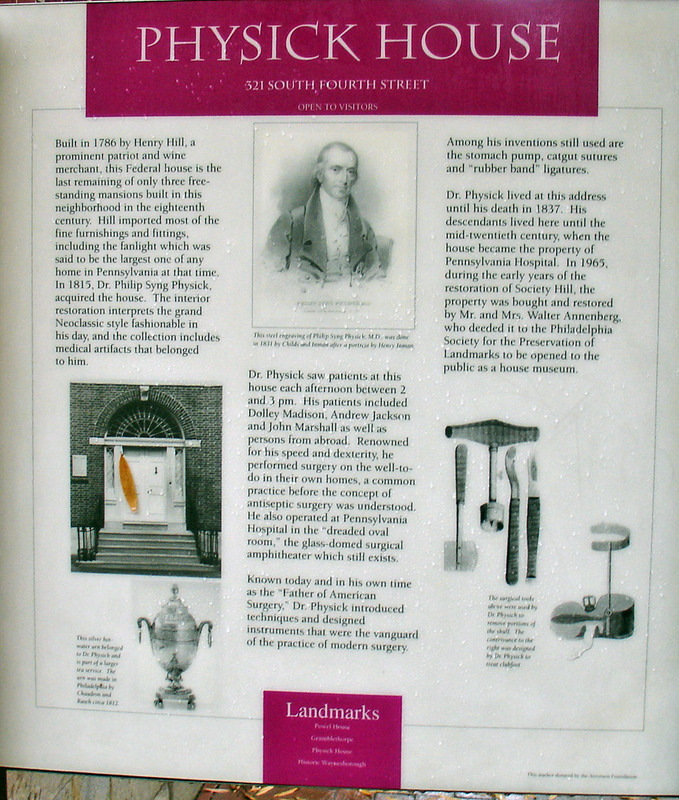 A room honoring Dr. Physick and his many surgical inventions is also on the second floor. The final stop is a bedroom, and here, besides the spectacular bed, are several fine Chippendale pieces. 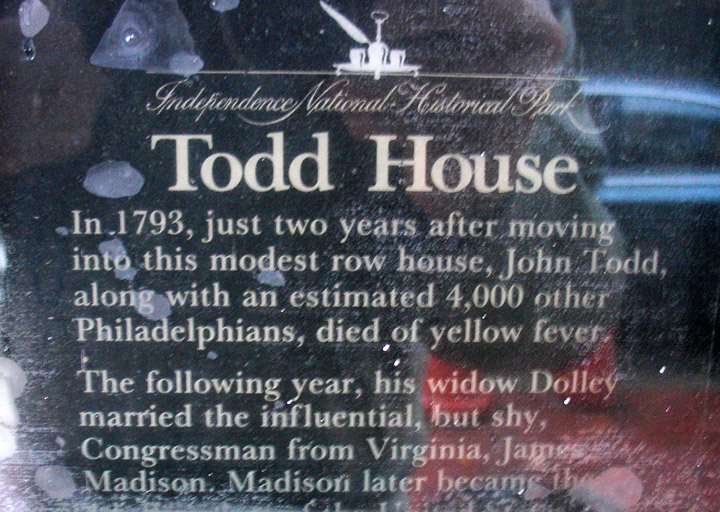 On the corner of 4th and Walnut Streets stands the Todd House, home of Dolley Madison. 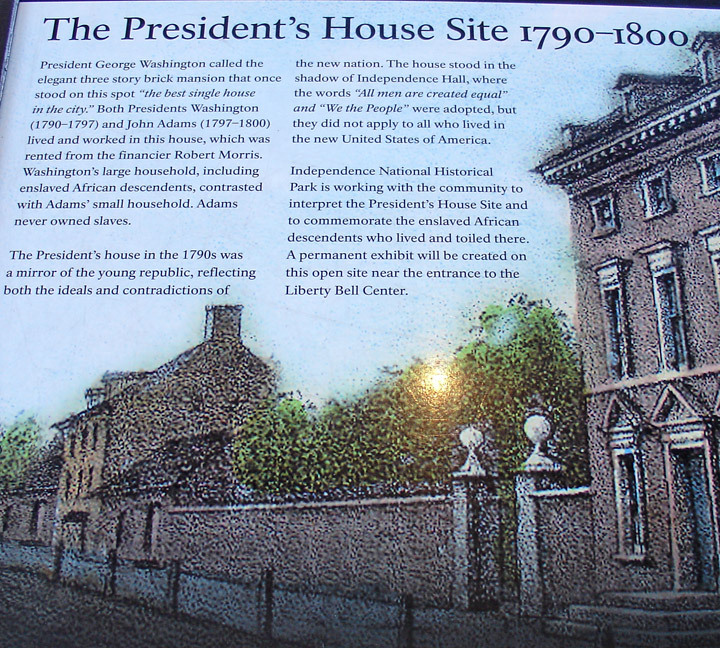 It was built in 1775 and occupied from 1791 to 1793 by John Todd, Jr., and his wife, Dolley Payne. After Todd's death in the yellow fever epidemic of 1793, she married James Madison, a young Virginia politician who was to become our fourth President. 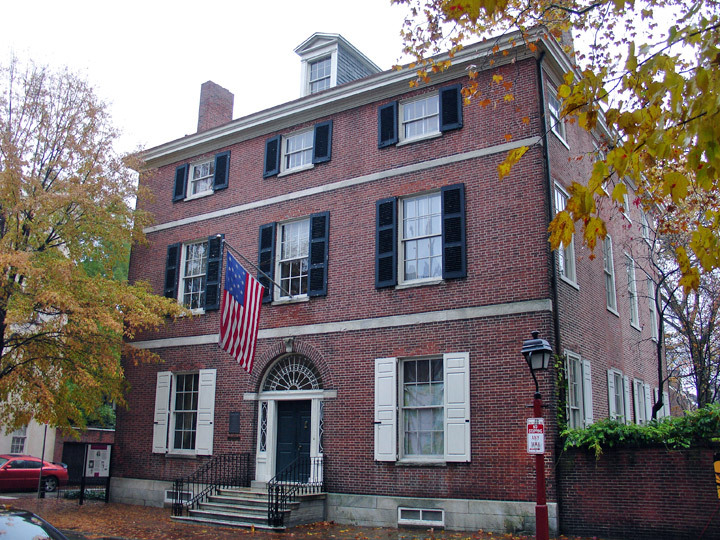 Stephen Moylan, the Revolutionary War general, lived here from 1796 to 1807. In reference to fighting fires, Ben Franklin noted, "an ounce of prevention is worth a pound of cure." In 1730, the most disastrous fire to rage in Philadelphia's history burst from the timbers of Fishbourn's wharf, a Delaware River structure. All the stores on the wharf burned and the fire spread across the street destroying three more homes. Damage ran into several thousand pounds. Benjamin Franklin commented in his Gazette that as there was no wind that evening, if people had been provided with good engines and firefighting instruments, the fire would likely have been contained. After that blaze, the Common Council of Philadelphia ordered fire equipment imported from England. Leather buckets, fire hooks, ladders, and engines were distributed at strategic points around town. A local resident even built his own fire-engine which "threw the water much higher" than the London models. It was to take 140 years, however, until the city of Philadelphia finally created its own fire department in 1871. Yet, Philadelphia has never suffered a conflagration on the scale of the 1666 Great Fire of London, nor of the fires in Charleston in 1740 and Chicago in 1871. This was in large part due to the efforts of — who else — Benjamin Franklin. 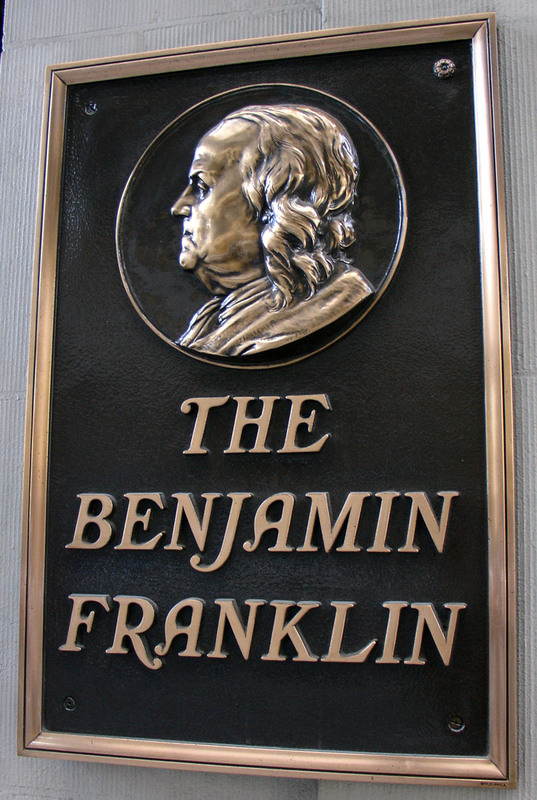 Franklin, in his Gazette, gave suggestions on fire safety: "In the first Place, as an Ounce of Prevention is worth a Pound of Cure, I would advise 'em to take care how they suffer living Coals in a full Shovel, to be carried out of one Room into another, or up or down Stairs, unless in a Warmingpan shut; for Scraps of Fire may fall into Chinks and make no Appearance until Midnight; when your Stairs being in Flames, you may be forced, (as I once was) to leap out of your Windows, and hazard your Necks to avoid being oven-roasted." In a Gazette article of 1733 Franklin noted how fires were being fought. "Soon after it [a fire] is seen and cry'd out, the Place is crowded by active Men of different Ages, Professions and Titles who, as of one Mind and Rank, apply themselves with all Vigilance and Resolution, according to their Abilities, to the hard Work of conquering the increasing fire." Good-will and amateur firefighters were not enough, though. Franklin suggested a "Club or Society of active Men belonging to each Fire Engine; whose Business is to attend all Fires with it whenever they happen." Franklin's recommendations ultimately led in 1736 to the forming of Philadelphia's first volunteer fire brigade, the Union Fire Company. So many men wanted to join Franklin's Union Company that he suggested it would be more beneficial to the salubrity of the city if they formed their own fire brigades. In the next several years, Philadelphians witnessed the birth of the Heart-in-Hand, the Britannia, the Fellowship, as well as several other fire companies. The logical next step was to form a fire insurance company. In 1751, Franklin and members of his Union Fire Company met with firefighters from other brigades for such a purpose. Over several meetings, insurance articles were discussed, drawn up, and presented publicly. All interested in subscribing to the project were told to sign a Deed of Settlement. The first to sign, Governor James Hamilton, was the son of famed "Philadelphia lawyer" Andrew Hamilton (see Independence Hall). Directly below Hamilton's signature are those of Benjamin Franklin and Philip Syng. 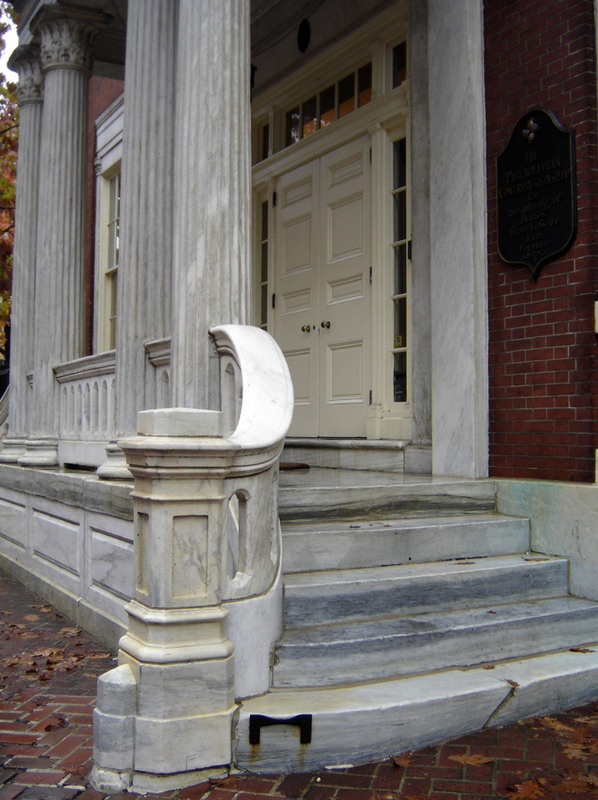 Initially, over 70 prominent Philadelphia citizens became subscribers. On April 13, 1752, these men came together to elect a Board of Directors and Treasurer, who met for the first time on May 11, 1752. 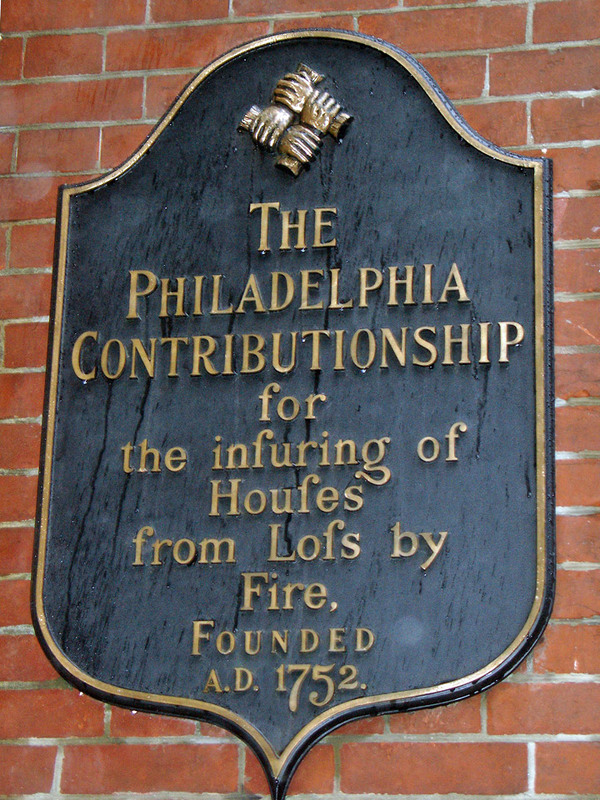 At that meeting it was affirmed that those subscribed had agreed to establish an insurance company by the name of The Philadelphia Contributionship for the Insuring of Houses from Loss by Fire, and "to be and continue to be Contributors unto and equal Sharers in the losses as well as the gains." A dozen Directors were elected to the board. 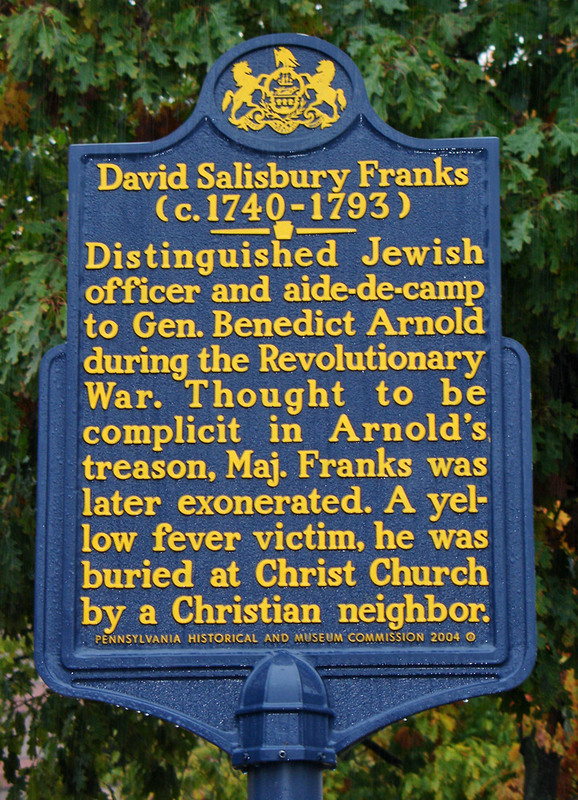 Franklin's name headed the list, followed by Philip Syng. 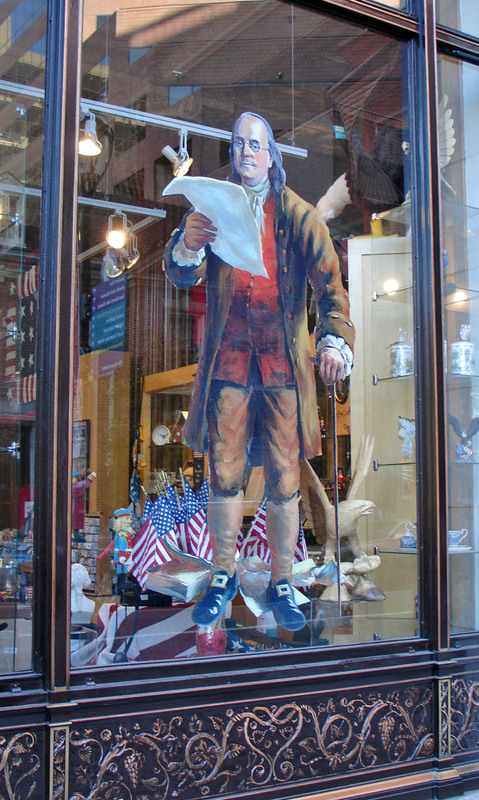 Syng, yet another of those extraordinary early Philadelphians, was an eminent silversmith and creator of the inkstand from which the Declaration of Independence was signed. In addition to being a vestryman at Christ Church and a member of the Philosophical Society, Syng found time to design the corporate seal for The Contributionship. Policyholders were required to affix these metal fire marks on their houses. Today, in Philadelphia, fire marks adorn many older and newer houses like a boutonniere on a suit. 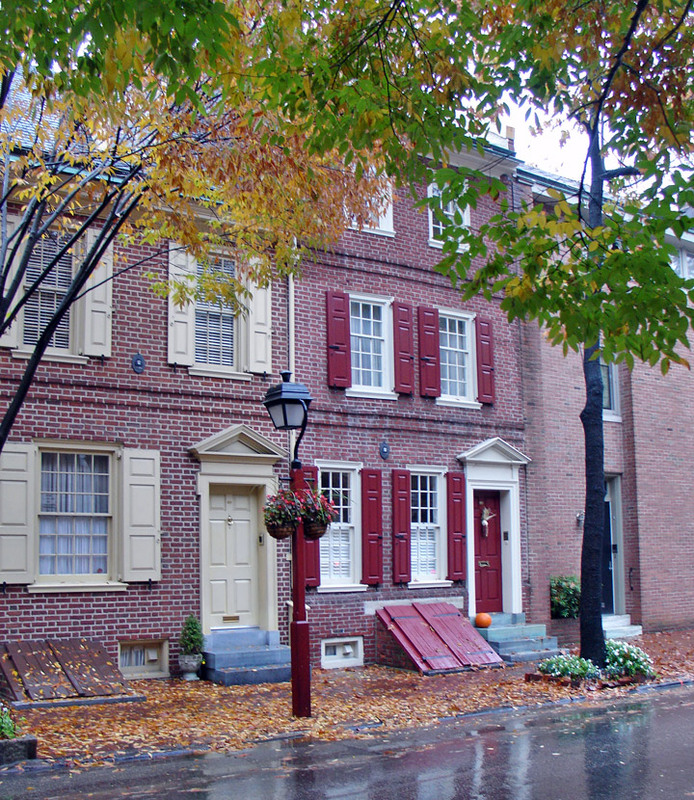 Several Quaker merchants served on the original Board as did Samuel Rhoads, the Master Builder of Pennsylvania Hospital — the oldest continually insured institution in the country. Rhoads became the firm's first Surveyor, assigned to inspect buildings and determine if they were appropriate risks for The Contributionship. Once the recommendations of the Surveyor were made, all Directors voted on whether a property should be insured. All this occurred at a monthly meeting, which continues to this day (there are 10 meetings each year, and, of course, the directors have different duties now). The first group of Directors, who came up for re-election yearly, decided to levy fines on themselves in cases of absence or tardiness from these meetings. Money from these fines accumulated and was earmarked for civic improvements. The earliest fine money went into making and placing mile markers between Philadelphia and Trenton. 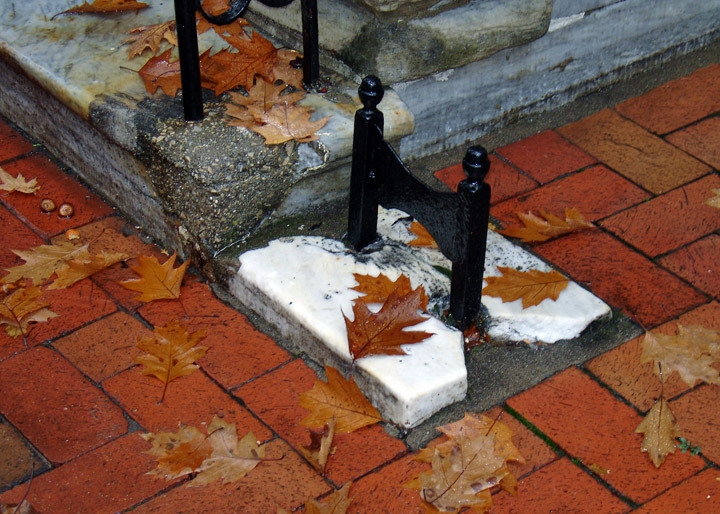 Today a weather-beaten mile marker can be seen in The Contributionship's garden, a reminder of the firm's philanthropic past. The first policyholders took out policies for seven years. After expiration, the premium money was returnable, subject to certain exceptions. Fire losses and office expenses were paid with money taken from a proportionate contribution of each policyholder. Prudence coupled with providence have been hallmarks of The Contributionship. Houses built not conforming to legal specifications were denied insurance. Mrs. Lydia Biddle, for instance, was denied insurance because of an unlawful wooden bakehouse adjoining her home. Early policyholders had to have a trap door to the roof as a way of fighting roof and chimney fires. 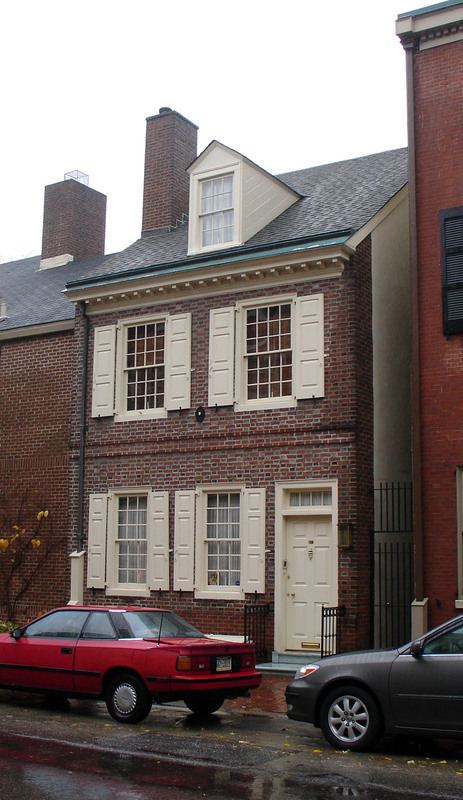 During the British occupation of Philadelphia in 1777, a chimney sweep hired by the firm was sent around to occupied houses to maintain fireplaces. The lightning rod, invented by Director Ben Franklin, also helped to deter fires. Houses with trees in front of them were not insured because early hoses could not maneuver around them (this gave rise to a competitive company, the Mutual Assurance Company, which was better known as the Green Tree, which existed until 1997). High-fire-risk businesses, such as apothecary shops and breweries, were either not given insurance or insured at significantly higher rates. Later, when skyscrapers were being built, the firm refused to insure them — and to this day, still don't. However, they do insure high-rise condominiums providing there is adequate firefighting equipment that can reach the insured space. Their judgment proved sound when the earliest Philadelphia skyscraper, the Jayne Building, housing pharmaceutical supplies, had a crippling fire which destroyed its top floors. The Contributionship was fortunate in 1752, its first year, in that 143 policies were written and not one fire was recorded. In 1753, a house on Water Street became the first insured property to burn. Damage was great, but Franklin was happy to report in the Gazette that damages were to be immediately repaired without cost to the owner. Cost for repair totaled 154 pounds, nearly a third of the Society's assets. Each member had five shillings threepence per pound of deposit deducted to pay for the fire. Over time The Contributionship's assets grew and they invested their money in various ways. They wrote mortgages and invested in stocks and bonds. They donated money to the volunteer fire companies who responded to structures insured by The Contributionship. Though volunteer fire brigades responded to all fires, they had more compelling reason to fight fires at buildings bearing The Contributionship's hand-in-hand fire mark. These fire marks served several functions. They indicated to fire companies that The Contributionship would reward them for a job well done. Often, firefighters were members of The Contributionship. The less damage to a building, the less deducted from their own premiums. However, if a house was uninsured, the fire would be put out regardless, despite what some modern historians and interpreters may claim. In any case, fire brigades would usually bill the uninsured householder or an insurance company with properties nearby to seek payment for their fine work in battling the blaze. 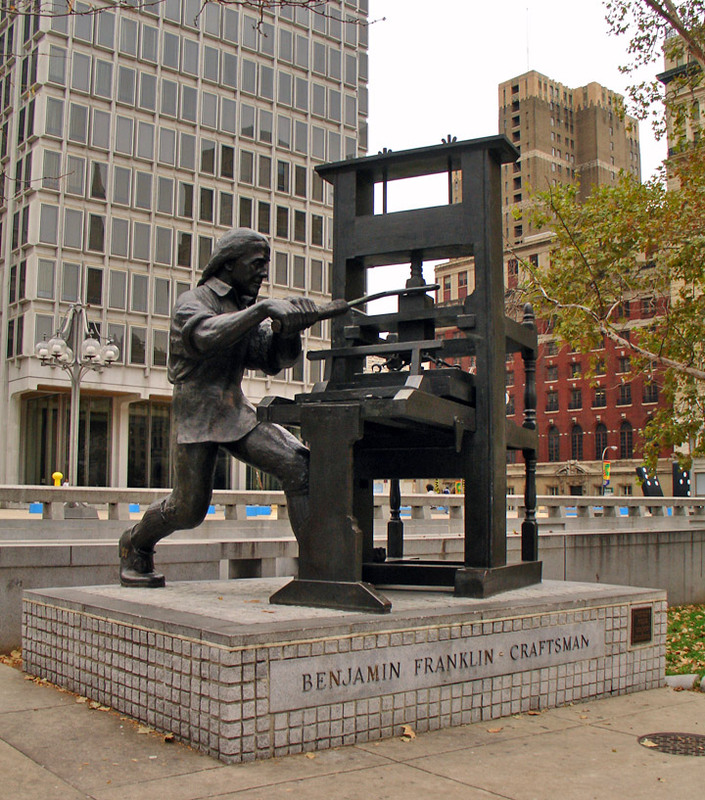 Philadelphians were keenly aware that the growing city's economic well-being rested in the well-being of its citizenry. Allowing buildings to burn, perhaps spreading into larger fires, made no sense. Philadelphia understood even then the interconnectivity of its infrastructure and its economic health. When one citizen suffered, all suffered. This building was erected in 1836 as home to The Contributionship, which previously operated out of various houses and taverns. Today, the building is used as their headquarters and contains a small but compelling museum presenting a fascinating collection of memorabilia. There are fire marks, firemen's hats, miniature engines, lanterns, and other accoutrements. A silver "speaking trumpet" once used to tantara orders at confused fire sites is among the more interesting artifacts because of its rarity. A fiery eagle clutching a hand-in-hand fire mark and an American flag carved by Collins West catches the visitor's eye. Fascinating, too, is a survey of Carpenters' Hall made in 1773. 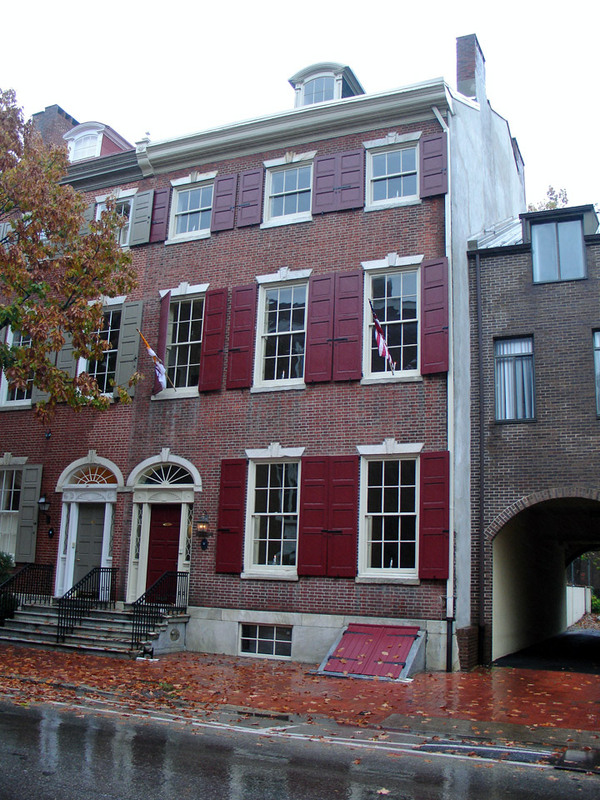 You will also find surveys for the homes of John Penn (William Penn's son) and Benjamin Franklin. The second floor, which is open to the public by appointment only (see below), is spectacularly elegant. The board room and the adjoining dining room are lighted by superb crystal chandeliers. A colossal and beautiful walnut table designed by Gottlieb Vollner dominates the room. Similarly stunning are the chairs which surround the table — they were crafted by William Sanderson from bird's-eye maple. Screens on latches graced the backs of the chairs nearest the room's marble fireplace — they were designed to channel hot air around the circular table so all Directors would be warm, but those closest to the fire would not become rump roast. Today, only the latches remain. A seating plan on the wall names the holders of the twelve Directors' seats since The Contributionship's inception. Across the hall is a room which might be called a double parlor in which the company holds its meetings. The grand table designed by William Russell in 1892 is noteworthy. This space formerly housed the treasurer's family's two bedrooms. Note the especially fine marble fireplaces and gilt mirrors. Crystal candelabra and cachepots enhance the scene. Fine portraits of past Directors stare back at us. Their conservative countenances joined with the timeless strength of the room evince a strong company nearly 250 years old, confident in its future. While on the second floor the visitor can play a "Where's Waldo" game looking for the hand-in-hand fire marks instead of Waldo. They are to be seen everywhere, from fireplaces to sideboard — there are at least a dozen. The sideboard was designed by Michael Deginther. 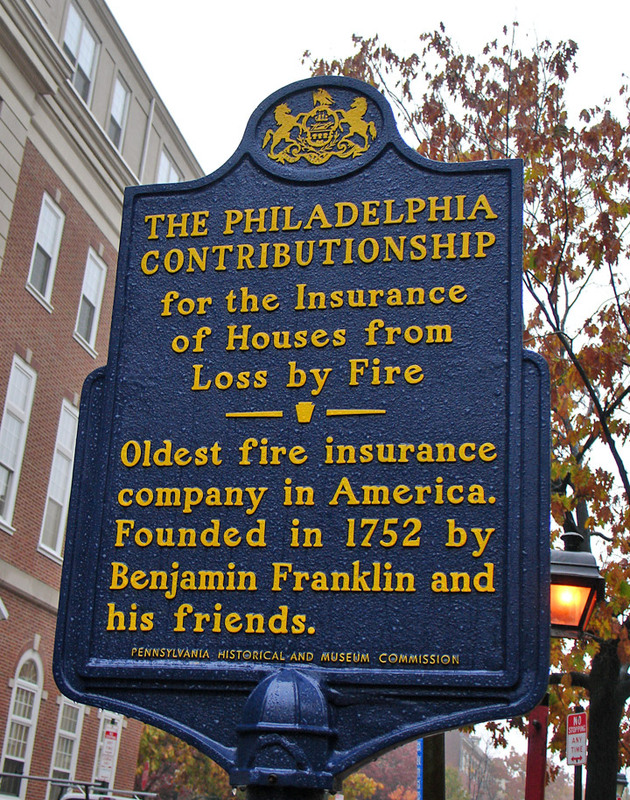 In addition to supplying the insurance needs of Philadelphians for nearly 250 years, The Contributionship has of late provided another valuable service. 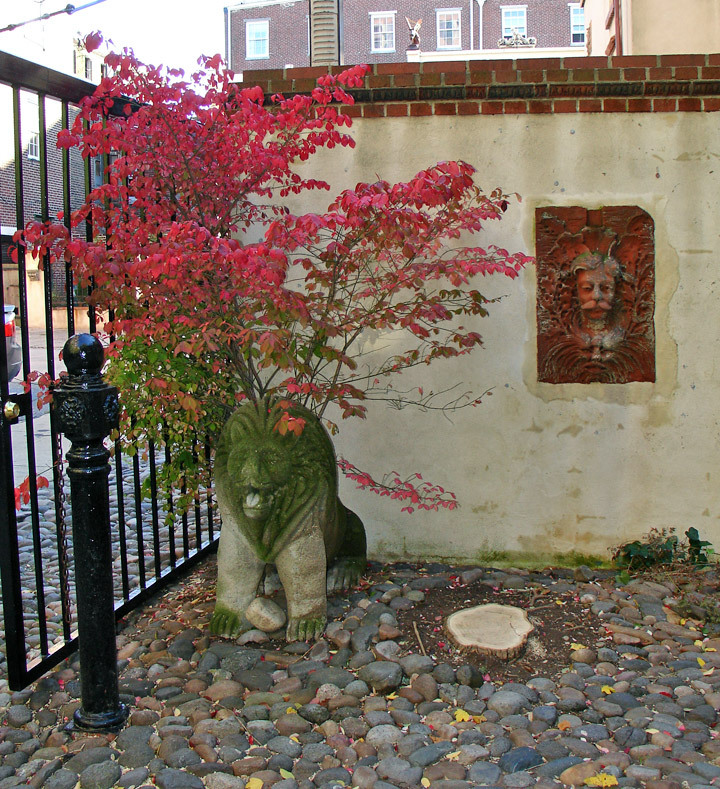 Society Hill, the neighborhood of which The Contributionship is a part, has over the last 40 years been transformed like the proverbial phoenix. 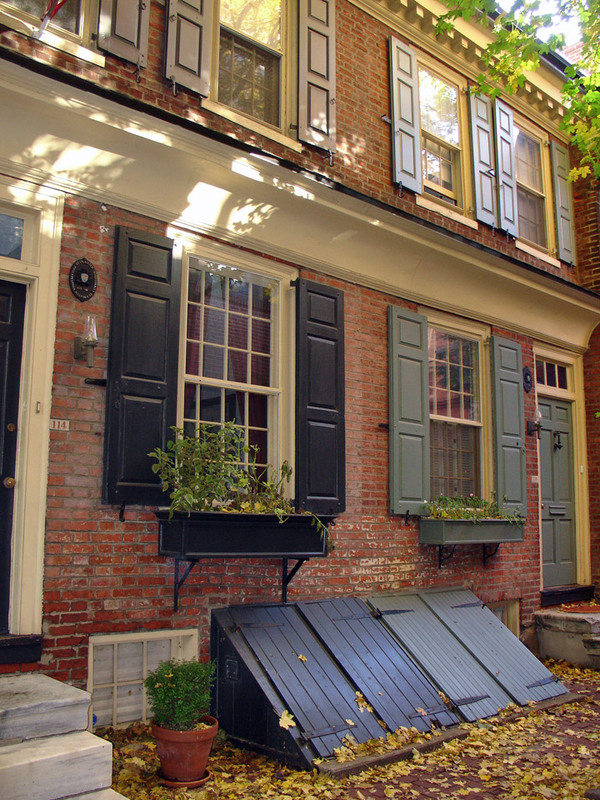 Once, one of the city's most delapidated areas, the neighborhood now contains more than 600 renovated houses and more 18th-century architecture than anywhere else in the entire country. 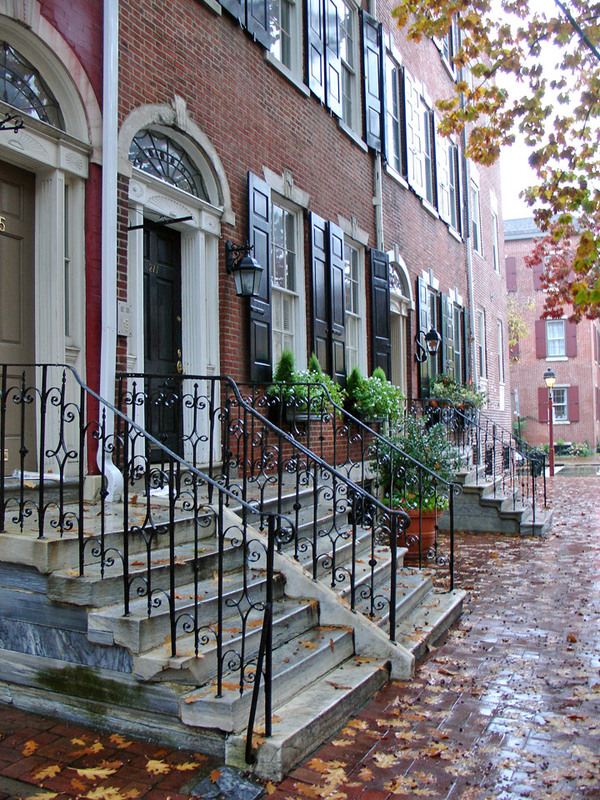 The Philadelphia Redevelopment Authority acquired many deteriorated properties in the neighborhood and sold them to private individuals with the agreement that the houses would be restored. As many of these houses looked nothing like they did originally, some owners had to use past Contributionship insurance surveys and records to aid them in recreating floor plans and engineering features of these properties. Many of the buildings you will visit are now, or have once been, insured by The Contributionship. 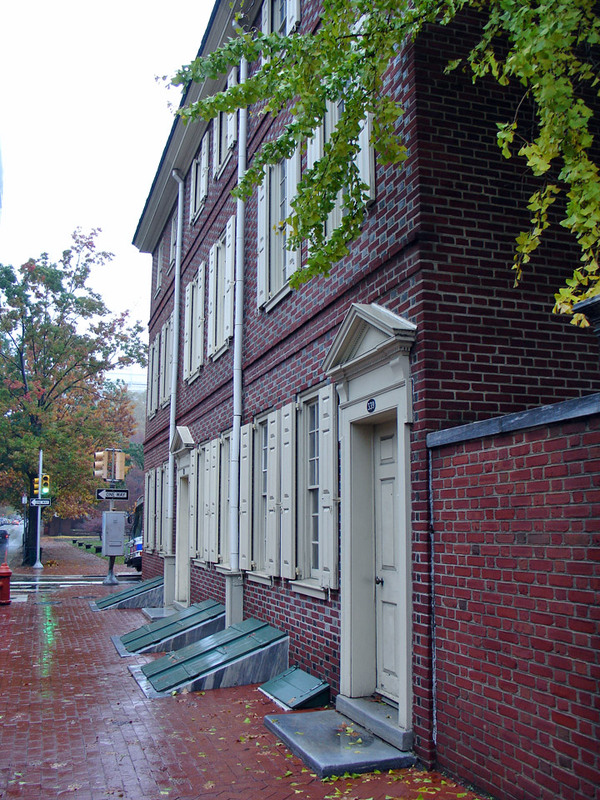 They include Pennsylvania Hospital, Christ Church, Old Pine Street Church, the Powel House, Carpenters' Hall, Society Hill Synagogue (when it was the Spruce Street Baptist Church), and, naturally, Benjamin Franklin's 1766 house on Market Street. Any virtual visitors with an interest in insurance or firefighting are urged to read Nicholas B. Wainwright's A Philadelphia Story — The Philadelphia Contributionship for the Insurance of Houses from Loss by Fire, from which much information on this page was found. Return to 2nd, and turn right a few steps to visit the Fireman's Hall Museum. 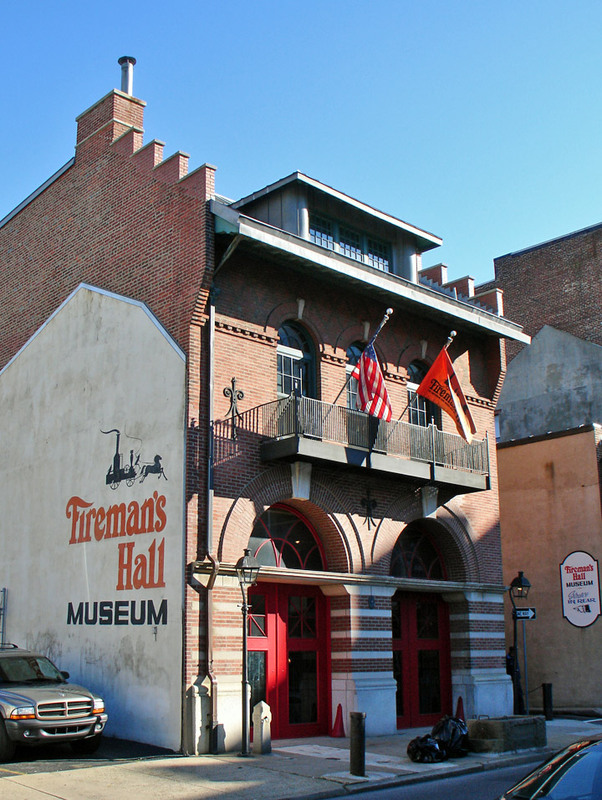 Benjamin Franklin, who organized the first fire department — the Union Fire Company on December 7, 1736 — would be proud indeed of this unique museum, for there is nothing connected with fire departments, fire fighting and firemen that is not here. There are fire engines from 1700s and 1800s, all equipped with beautiful old brass fixtures. The first ones were hand-drawn, hand-operated by the men themselves and before our modern ones, of course, there was the horse-drawn fire engine. Here are the leather buckets for water, miniature engines, nozzles, hoses, firemarks from old houses, parade hats, early fire insurance policies, medals and even a brass pole which goes from the third to the first floor, typical of those that firemen slid down for generations. Perhaps the art of the fire engine was carried to its apogee in the "Spider Hose Reel," made in 1804. Returning to 2nd and Arch Streets, turn left on Arch and walk again toward the river. 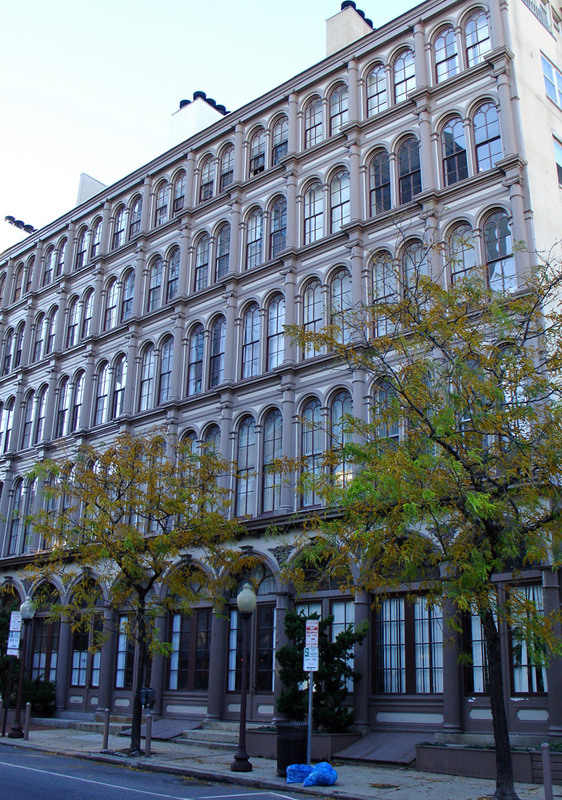 On the northwest corner at 101-111 Arch, there is a series of fine iron-front buildings constructed between 1855 and 1857. 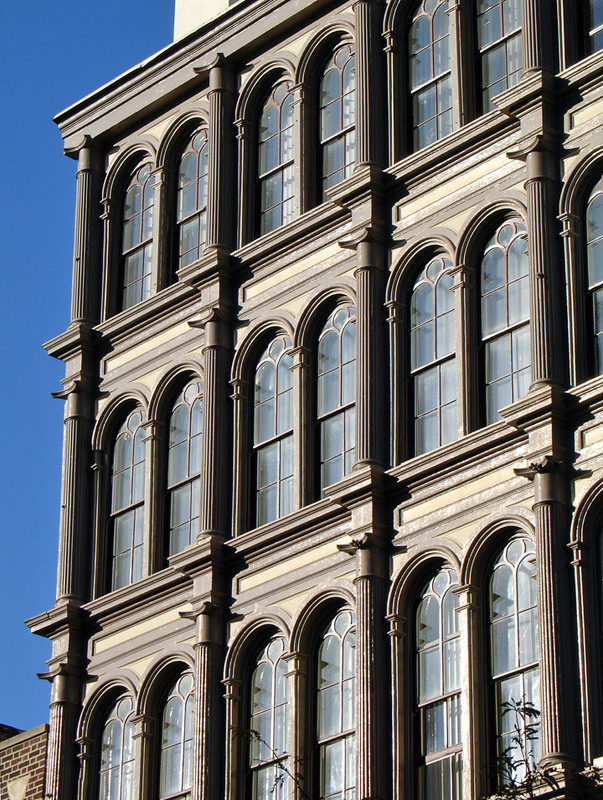 The group typifies the buildings the Victorians gave us, which today are appreciated for their beauty and functionalism. 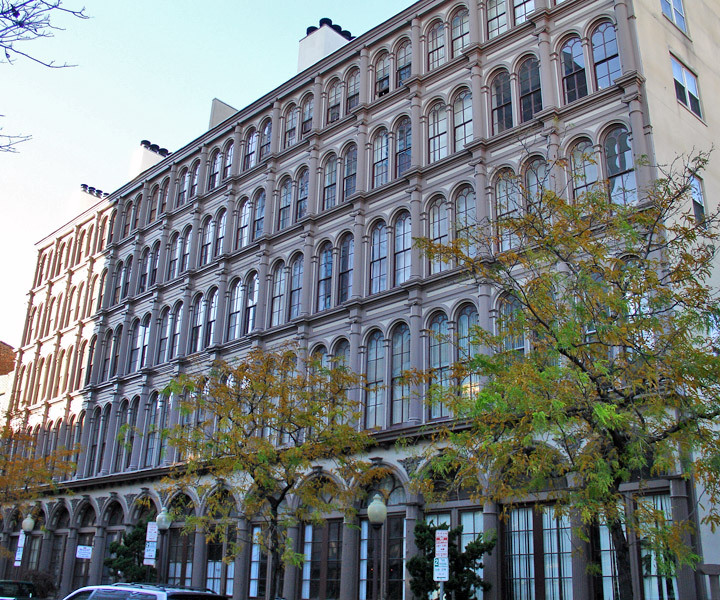 Warehouses, commercial buildings and lofts don't have the allure for the layman that grand town houses or even small, intimate ones have. Man likes to see the lares and penates of his ancestors — the antiques — in their proper surroundings. However, nothing reveals the character of a town or city like the buildings near its rivers and wharves. Here was the lifeblood of Philadelphia.